Bank of America, former Home Savings branch in Berwyn, Illinois. Image from Google StreetView; see below for details. As we reach the end of 2014, I wanted to give you an update about all that is happening behind the scenes–as well as to share some thoughts about those Home Savings branches constructed outside California, and the effort to add them to the story. It has been a productive fall! With support from Howard Ahmanson Jr. and the Ahmanson Foundation, I have been on leave, writing my book on the art, architecture, and urban context of the Sheets Studio work for Home Savings. Four of the planned seven chapters are drafted: The Story, Origins, Location, and Reception. That leaves Process, Meaning, and Legacies as the chapters to draft this spring. I am also speaking with presses about a full-color, heavily illustrated book, as well as museums about a possible exhibition. And, on Monday, I was interviewed by Paul Bockhurst for his documentary projects about Millard Sheets and other Claremont artists, and I toured Claremont Heritage. Both the Location and Legacies chapter have sent me back into the records to track down dates and addresses–and so this week I published a full revision of the Definitive List, with more locations, and more accurate construction dates. There are two maps: one mapping all of the 168 former Home Savings locations, and the other with all the 159 other Sheets Studio public art sites. I welcome more information about their current status as well. The question of current ownership–and whether those owners realize what they have–has finally driven my new post off the to-do list and now to your screens. Vacant former Home Savings location at Bannister Mall, Kansas City. Image from Google StreetView; see below for details. From 1947, when Howard Ahmanson purchased it, Home Savings had regular periods of growth, through acquiring other savings-and-loans, petitioning the state to expand their territory, and final due to changed regulations that allowed expansion throughout California, in around 1976, and then across the nation, in the mid-1980s. Though Millard Sheets had completed retired from the studio in 1980, Sue Hertel and Denis O’Connor, who had worked with Sheets on these commissions for decades, continued to produce similar work. Around 1990, Home Savings also commissioned some other artists, such as Marlo Bartels, Astrid Preston, and Richard Haas, to produce branch artwork, with a similar focus on community identity and history. These locations were constructed in Florida, Illinois, Missouri, New York, Ohio, and Texas. Chase was interested in taking Washington Mutual from the federal government in part because of its network of locations on the West Coast, where Chase had not had a presence; according to my list, Chase currently owns at least 69 locations with Sheets Studio artwork, mostly former Home Savings locations. 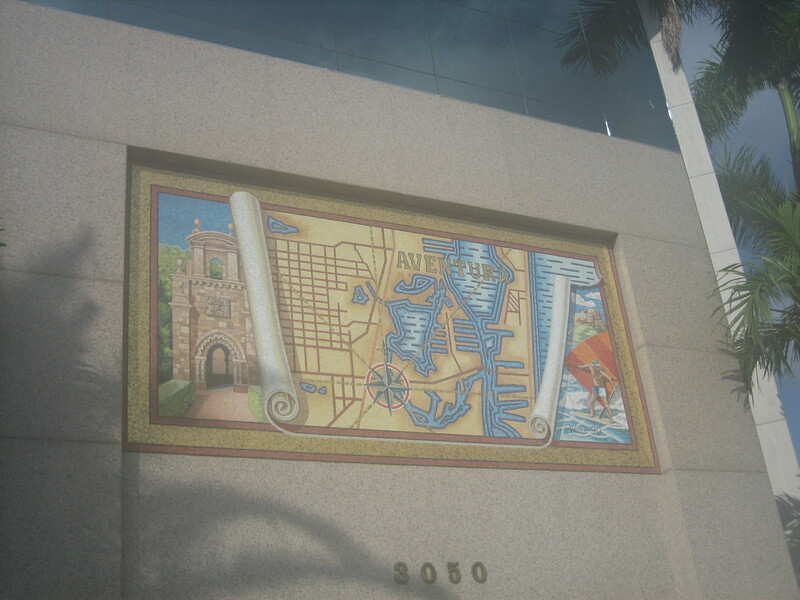 Wells Fargo, a former Home Savings branch in St. Petersburg, FL. Image from Google StreetView; see below for details. But what gets really interesting is what happened to the 52 Home Savings locations with Sheets Studio artwork outside of California. Home Savings had for decades used their art and architecture as part of how to stand out against their traditional competitors in the West, including Wells Fargo and Bank of America, both based in San Francisco at the time. While both had some tradition of historic artifacts or mosaic banks, these seemed pale imitations to the number and uniformity of the Home Savings locations. Yet, outside of California, I have found that, over and over again, it is Wells Fargo and Bank of America that are using the former Home Savings buildings–either purchased outright, or by acquiring banks that had acquired the location, such as Wachovia in Florida. Whether these locations were sold off by Washington Mutual in 1998 or Chase in 2008, I am not sure, but it seems that the California banks understood the power of this art and architecture, and they wanted to be first in line to pick up the former competitors’ locations in other states. I have found 12 locations owned by Bank of America, mostly in Illinois; 12 by Wells Fargo, mostly in Florida; and a few by US Bank in California, and then local credit unions and banks and trust companies elsewhere. Thus, in a way, even when these banks are isolated–only five in all of Ohio, six each in Texas and Missouri, fifteen in Illinois, nineteen in Florida, just one in New York–they actually are still part of a conversation with Home Savings, carried on by its once-rivals that survive as well as by Chase, the steward of the largest number of these buildings. Below I post the full details for these outside-California Home Savings branches with Sheets Studio art and architecture, to aid those in these communities in seeing their value and working to preserve them. If an address brings you to this post, please contact me so I can connect you to the wider history of these buildings and their artwork. Home Savings 6115 S Pulaski Rd Chicago IL 1989 Bank of America Google StreetView mosaic – snow scene, ice skating Denis, Sue O’Connor are these interior? Not there? Home Savings 8745 N Waukegan Rd Morton Grove IL 1988 Bank of America Google StreetView Denis, Sue, Frank Homolka, Franco O’Connor are these interior? Not there?